Instant Pot Sloppy Joes are just yummy! Delicious, tangy, and a little sweet, with lots of ground beef, and the perfect amount of sauce. Piled onto a soft hamburger bun, they are one of the classic American comfort foods from my childhood. 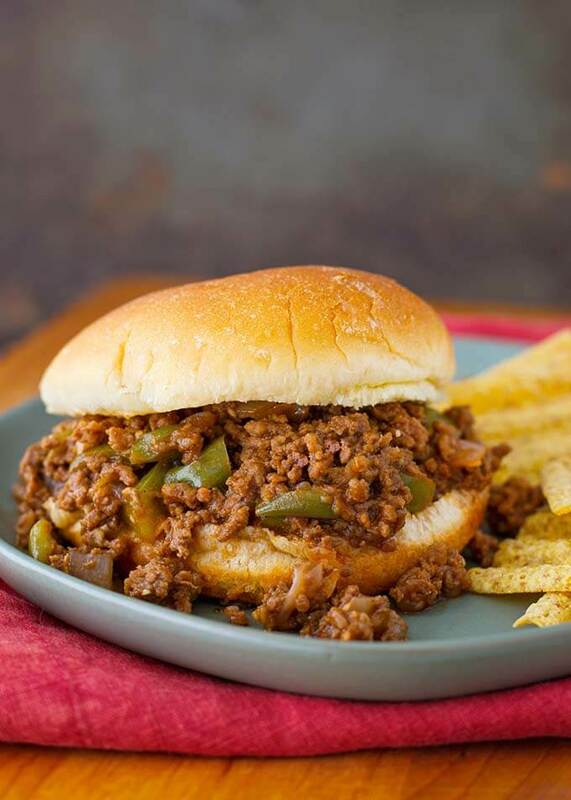 Pressure Cooker sloppy Joes are a one-pot meal that can feed the whole family. Very kid friendly! When I was a kid we ate so many wonderful meals that mom made us. 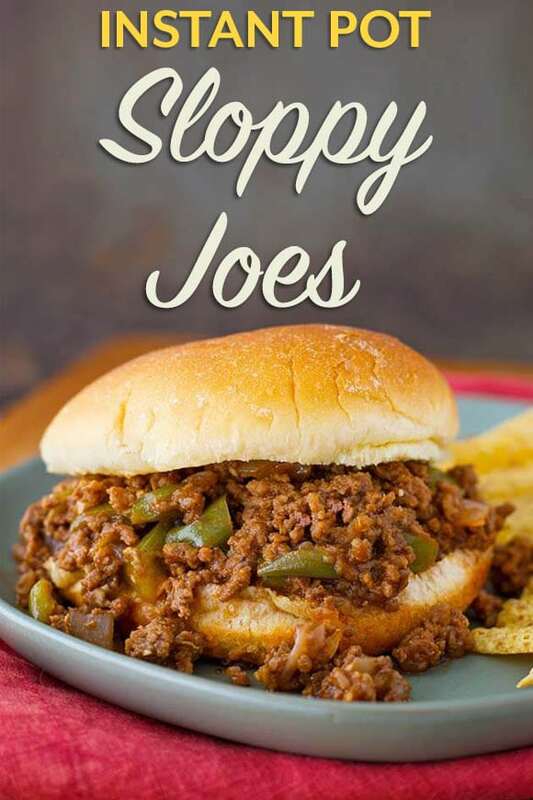 Sloppy Joes were a favorite of mine. all of that saucy ground beef that was kinda tangy and kinda sweet, piled on a bun. Yum! I always tried to eat it like a burger, holding it in my hands. I kept a fork nearby so I could get all of the stuff that dropped onto my plate. No crumbs left behind! 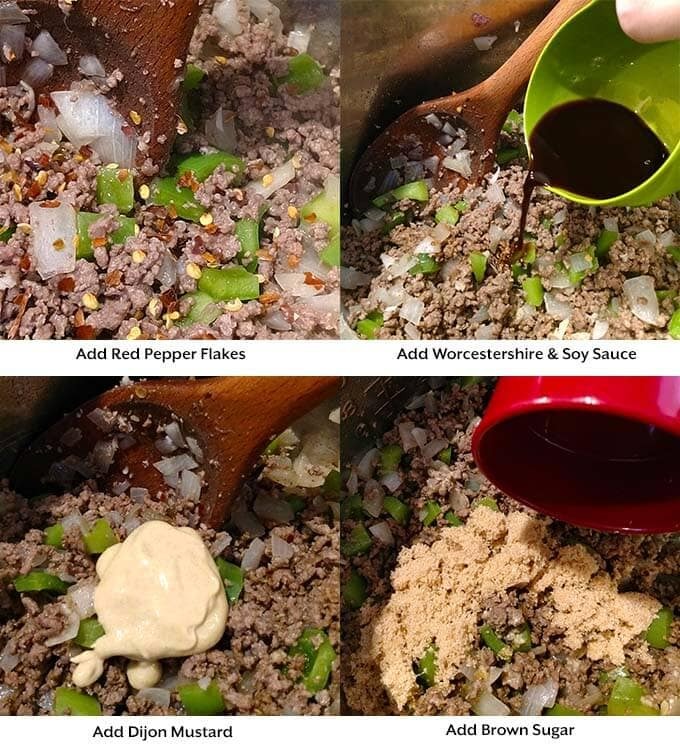 When you have ground beef or ground turkey to use up, Instant Pot Sloppy Joes are a great recipe to reach for. This meal takes less than an hour from start to finish. It can be made from the pantry staples most of us have on hand. It was a cinch to convert my recipe to Instant Pot Sloppy Joes. I try to make recipes that don’t get the BURN message that the new IPs seem to get more often. 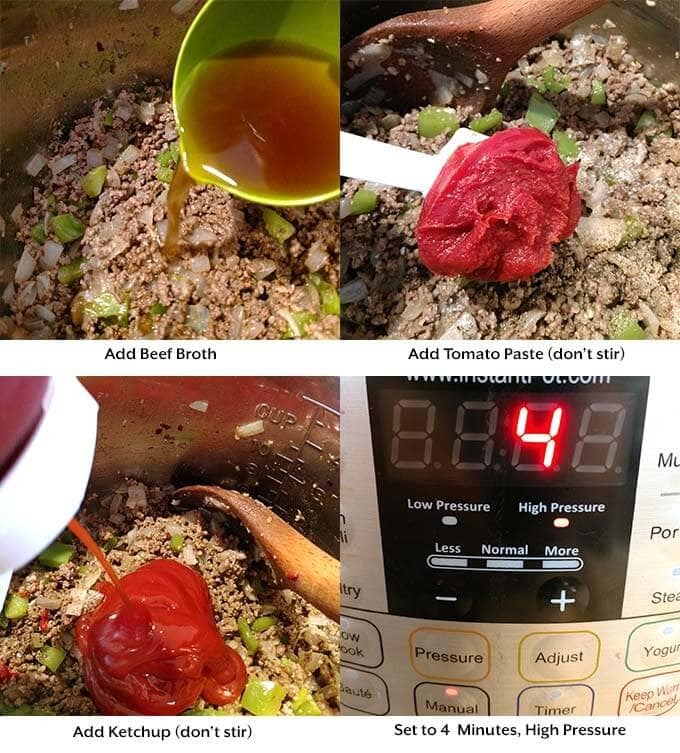 The trick in this recipe is to leave the tomato products on top and don’t stir them in until after they cook (the sugar in tomatoes burns easily). That allowed me to use less liquid! The tomato paste thickens it up nicely at the end, when you stir it. Good thing I decided to give it a go, because they are super easy, and absolutely delicious! This is a quick cooking recipe, so it is perfect for a weeknight meal. Instant Pot Sloppy Joes are a classic American comfort food. 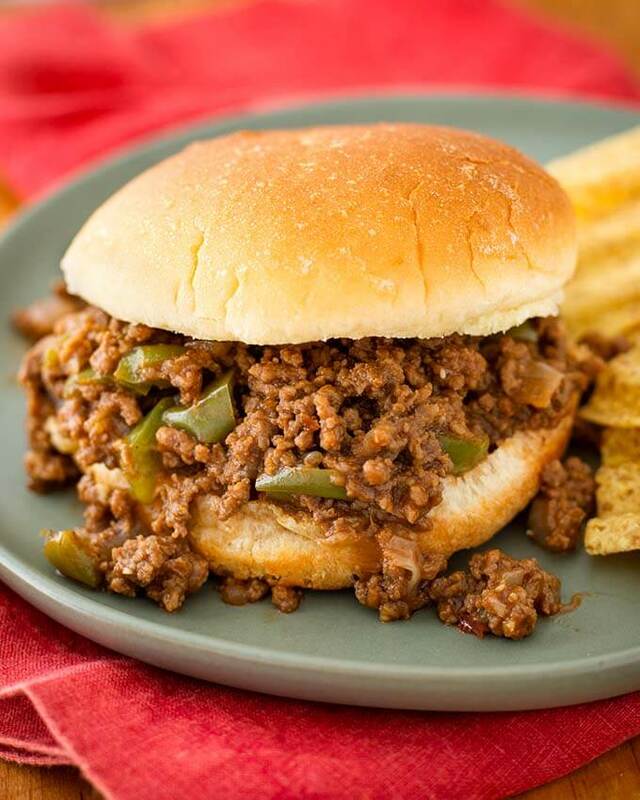 A flavorful tangy sweet ground beef mixture served on soft hamburger buns. 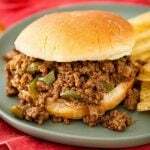 Pressure cooker Sloppy Joes are a tasty and fast meal. Turn on the pot's Sauté setting. 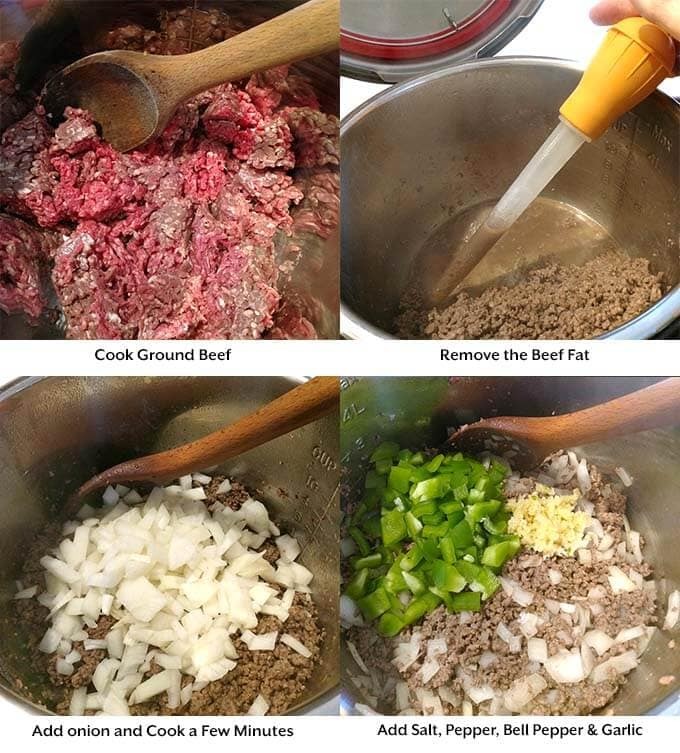 Add the ground beef (if using ground turkey, add some oil to the pot first). Cook, stirring occasionally, until the meat is mostly done. Use a spoon or turkey baster to remove the extra fat. Add the onion, salt, and pepper, and cook for a couple of minutes to soften. Scrape the bottom of the pot as you stir. Add the garlic, bell pepper, red pepper flakes, Worcestershire, soy sauce, Dijon, brown sugar, and beef broth, Stir well, scraping the bottom of the pot to get up any brown bits. Add the tomato paste and ketchup, but do not stir it in. Just leave it sitting on top of the meat mixture. Put the lid on and lock into place. Set the steam release knob to the Sealing position. Cancel the Sauté setting and press the Pressure Cook/Manual button (or dial). Then press the + or - button (or dial) to select 4 minutes. The pot will take a few minutes to come to pressure. After the cooking cycle is finished, let the pot sit undisturbed for 5 minutes (5 minute Natural Release). Then turn the knob to the Venting position (or push button) and manually release the remaining steam. When the pin in the lid drops down, open it and stir the Sloppy Joe mixture to incorporate the tomato paste and ketchup. Taste and adjust salt if necessary. *If using the 8 qt size pot, increase broth/water to 3/4 cup. I made these with ground turkey and they were so good. Hi Erin, that’s great! Ground turkey is so good! Thank you for your review! Made this recipe for my daughter’s birthday sleepover and all of the kids gobbled them up! We all enjoyed them. This recipe is a keeper! That’s great, Tanya! Thank you. So glad the kids all liked them! Made this the other night for dinner and everyone loved it. Even my husband who doesn’t care to much for sloppy joes! He said it was better then anything he’d ever had!